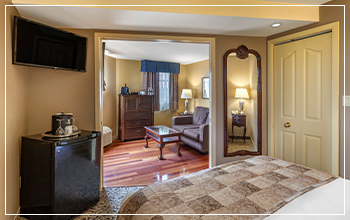 Stay overnight in a hotel room that combines vintage charm with modern comfort and the best location in town. Located in the heart of our historic downtown, The Parlour Inn’s Traditional guestrooms are perfectly suited for a sightseeing trip in Stratford, Ontario. 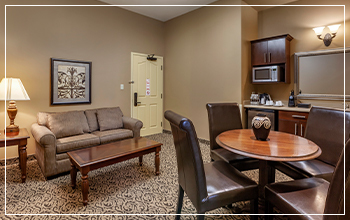 This cozy room offers great value to out-of-town guests looking for a comfortable place to rest their heads after a wonderful day of theatre, dining, and shopping. The Parlour Inn’s Traditional hotel rooms are clean and comfortable for guests staying with us mainly to see the sites of Ontario’s most charming town. Stretch your legs while exploring everything that Stratford has to offer. The Parlour Inn is located just minutes from many of the town’s most spectacular highlights. You won’t have to worry about being late for your matinee or evening cultural gala, as the hotel is walking distance to each of Stratford’s world-renowned theatres. After a cozy night’s rest and a delicious bite to eat at The Parlour Inn’s Gastropub, you will be perfectly prepared to embark on a springtime getaway in Stratford, Ontario. This room is ideal for corporate guests who will be attending a conference in our exceptional meeting facilities. When you stay in our Traditional Guestrooms, you will also be able to access a 24-hour exercise facility and high speed Internet. That way, you can take care of business and yourself while visiting our historical hotel. 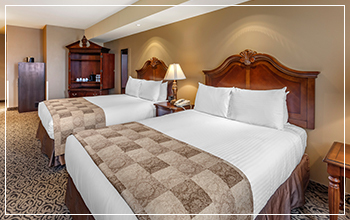 The Traditional hotel rooms offer a Queen Bed and table for two where you can study the Stratford Festival playbill or catch up on conference details. The Traditional rooms also offer an always well-kept 3-piece bath. 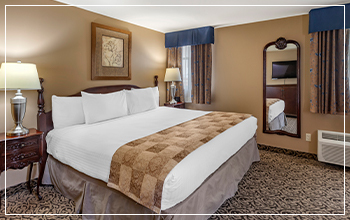 At approximately 200 square feet, these well-appointed and immaculate guestrooms provide every essential for your visit. Guests staying with us while visiting friends and exploring the sites will have enough comfort, space, and amenities to ensure that they can prepare for a conference or date night and then rest comfortably in this warm and cozy hotel room. 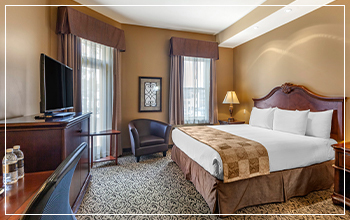 Book now or Call or to reserve a hotel room with great value and convenience for your escape to Stratford, Ontario. Luxurious accommodations with a King Bed and separate living area. Each King Suite is individually appointed with unique features. Some may include wet bar and mini fridge, sofabed, fireplace or whirlpool soaker tub. These suites offer the ideal comfort for your visit to Stratford, especially for longer stays and special getaways.